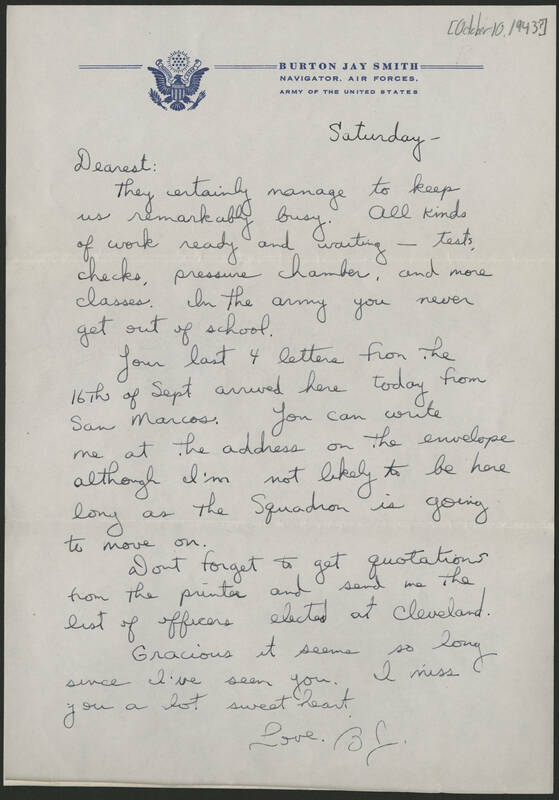 [October 10, 1943] Saturday- Dearest: They certainly manage to keep us remarkably busy. All kinds of work ready and waiting - tests, checks, pressure chamber, and more classes. In the army you never get out of school. Your last 4 letters from the 16th of Sept arrived here today from San Marcos. You can write me at the address on the envelope although I'm not likely to be here long as the Squadron is going to move on. Don't forget to get quotations from the printer and send me the list of officers elected at Cleveland. Gracious it seems so long since I've seen you. I miss you a lot sweet heart. Love. BJ.